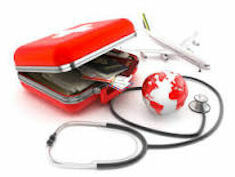 Prior to travelling it is always sensible to consider the medical implications of your visit to foreign countries. Some countries have an increased risk of illness and may need vaccinations and/or medications so you remain protected from potential infections during your stay. Our nurses are able to advise you fully of what may be needed or advisable depending on your itinerary. As this can be quite complicated, we would ask if you could fill in a travel questionaire and drop this into the surgery prior to your nurse appointment. This would allow us to give you better and more timely information. The travel questionnaire is available from reception or you can click here. Ideally this appointment should be soon after your holiday is booked and at least three weeks prior to your departure so that any course of vaccinations that are needed can be given in time and be effective. If you book a holiday at short notice, it is still recommended to contact the surgery for advice although on occasion we may direct you to a travel clinic if necessary. For online travel advice click here. If you are travelling in the European Union, you should apply for an EHIC card prior to leaving the UK. It is not a substitute for having travel insurance, though insurers may insist you have an EHIC card.